Now after the emoji, the sticker has also become the user's choice. In such a way, Facebook's instant messaging platform, WhatsApp, has added sticker features to the app to change the style of chatting. Many times people use stickers or emoji to express their feelings rather than writing. In such a situation, if you are thinking of making your own sticker, then today we will tell you some important steps through your article. Let's say that the sticker option appears in the latest version of WhatsApp's latest version 2.18 emoji section. A sticker pack will be available with new updates, but you can easily download other stickers of your choice from the built-in sticker store. There is also an option to download sticker from Google Play in the store. 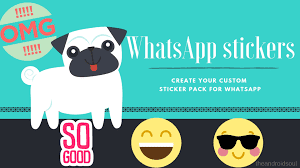 Before creating the sticker, note that your phone should have the latest feature of WhatsApp with the latest version of WhatsApp. If you want, you can change your photo sticker with the help of the steps described below. 1) First, download the Sticker Maker app from Google Play Store. 2) Open the app after the Sticker Maker app is installed. Click on 'Create new sticker pack' appearing in the app. 3) After this, fill the information sought, such as Sticker's name and sticker pack author. 4) After filling the details open the sticker pack. After this, you will see some boxes. 5) Click on the box with tray icon appearing at the top. Now two options will open in front of you-you can put a new photo or use a photo that is already present in your smartphone. The app will ask you for permission to access the phone before opting for the photo. 6) Make an outline around the area of the photo you want. After creating the outline, click the Save sticker. 7) After the tray icon image is set you will notice that you can add up to 30 custom stickers in the sticker pack. To add a new sticker, you can either click the photo or use the store photo in the phone. 8) If you think you have made a sticker, then click on the publisher sticker pack below. After this, you will see Yes and Cancel two options. Click Yes. By doing so, your new sticker pack will be added to Whatsapp. 9) Now you will notice that the stickers you have created with the other stickers in the WhatsApp are also present.